Find out what to plant in November with our seasonal list of flowers, fruit, vegetables and seeds. These can be ordered now for sowing, growing and harvesting over the coming months! Sow sweet peas in a cool greenhouse or coldframe for an early display next year. Keen gardeners may like to try growing perennial flowers from seed this month in the greenhouse. Varieties such as laurentia, delphinium, verbascum, foxglove, cyclamen and lupin can still be sown this month in a cool greenhouse. Stock up on seed sowing essentials. Continue to plant spring flowering bulbs. To speed up planting, invest in a Bulb Planter - particularly if you are planning to naturalise bulbs into a grassed area of the garden. 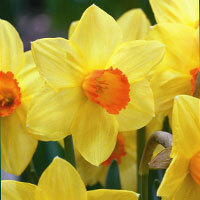 Continue to plant daffodil bulbs. When planting tulip bulbs avoid shallow planting as this may reduce the winter cold period that is essential for tulip bulbs to produce flowers in spring. Plant the Christmas Rose (Hellebore) now for beautiful winter flowers. Sow winter salads under glass, protected by cloches or on a bright window sill indoors. Choose types that won't require extra heat such as Winter Gem, winter land cress, purslane, and corn salad. Sow pots of herbs in a heated greenhouse or on a bright windowsill indoors. Try basil, dill, chives and parsley. 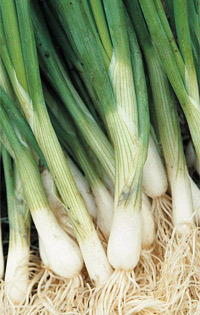 Sow Spring Onion 'Performer' under cloches. Sow Pak Choi under cloches outdoors. If you don't already have a cloche or coldframe, we now have a fantastic selection available online. Sow hardy Broad Bean 'Aquadulce Claudia' outdoors. Sow Pea 'Meteor' outdoors for an early crop next year. Plant overwintering onion sets and garlic. For something different this year, try the massive Elephant Garlic. Asparagus crowns can be planted now for tasty home grown spears. Rhubarb crowns can be planted now in well prepared soil. Add plenty of organic matter - they are hungry feeders! Plant out strawberry runners and plants. Plant out spring cabbage plants at the beginning of the month. 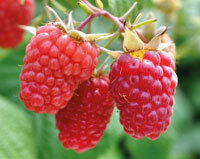 Plant raspberry canes and blackberries now and remember to put a support system in place for the canes before planting. Gooseberries and currants can be planted now for a vigorous start to next season. It's a great time to plant blueberry plants this month. Blueberries prefer a slightly acidic soil, but do very well in patio containers if your garden soil is not acidic. Try growing a mushroom log in your garden or alternatively grow some indoors.